Gray market electronic components are not just a recent problem. Long before IC foundries were set up in China, Indonesia, Vietnam, etc., to produce counterfeit semiconductor components, there were unscrupulous manufacturers turning out bogus components of all sorts. 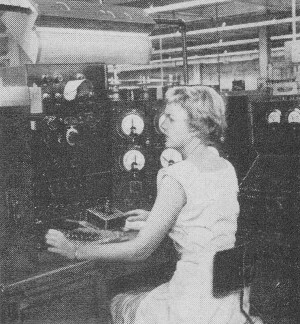 Marking unauthorized microprocessor and amplifier packages with an industry-leading brand name and part number is a real problem, but such practices extend back to the vacuum tube era. 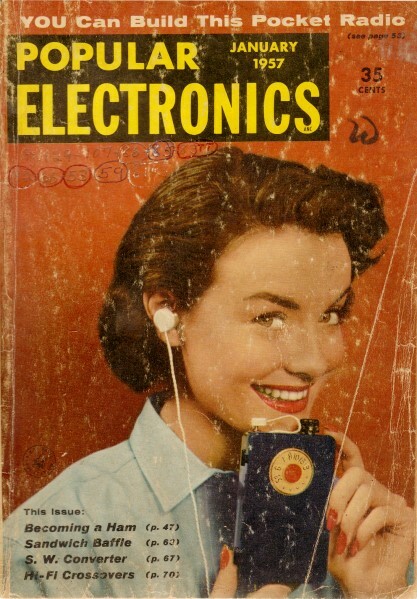 This story from a 1957 edition of Popular Electronics tells the story of how companies like General Electric and Sylvania dealt with the situation. See also: System Design: Fraudulent and Forged Parts Part I, Part II, by Walter Shawlee, Avionics magazine. The old warning about taking wooden nickels has returned in electronic guise: beware of counterfeit radio tubes! Every trade has its own kind of crooks. Electronics' contribution to the criminal roster is the fly-by-night dealer who buys up old, defective tubes for next to nothing, forges a new brand on them, and sells them at "bargain prices." 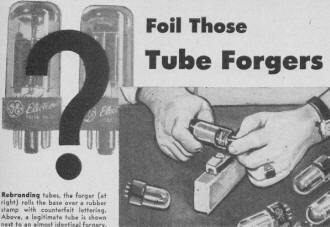 Forgers sometimes get hold of discarded tubes by pretending that they are to be used as targets in a shooting gallery. The tubes are then cleaned and polished to a fresh-looking gloss, and rebranded with the name of a prominent manufacturer. Most important, the rebrander removes the old warranty number and replaces it with a current code. Some forgers, equipped equally with gall and skill, actually have the nerve to turn their newly "guaranteed" tubes back to the manufacturer, complaining indignantly that the tube does not work and "please send a new one, pronto." Of course, the crook and his customer will be the first to yell when the manufacturer's loss shows up in a price increase to be borne by the entire public. Large manufacturers, like Sylvania and G.E., estimate a million dollar loss annually through this kind of fraud. It's Up To You! The tube industry recently started an all-out campaign to stop this racket. Each tube returned to the manufacturer is now closely examined to make sure that it is legitimate. Furthermore, the factory destroys all defective reject tubes to keep them from falling into the hands of the forgers. Only first-rate tubes are put on the market. 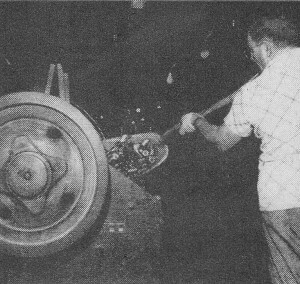 Nearly 500 million receiving and allied type tubes were manufactured during 1955, with a considerable percentage destined for the replacement tube market. For each new replacement tube sold, a dud of that type usually was discarded. The above figure highlights the importance of halting the flow of duds into illicit channels. But public cooperation is also needed to dry up the black market. Huge tube crushers are stoked with reject tubes at the General Electric Tube Department. (upper) and at Sylvania's tube plant at Emporium, Pennsylvania (lower). Such a procedure keeps substandard tubes off the market. These companies feel that all burned-out or defective tubes should be smashed to keep them out of the reach of criminal rebranders. 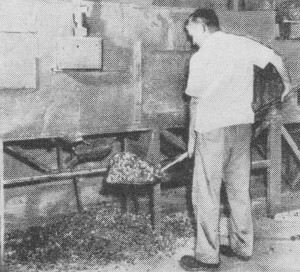 After crushing, a flotation process separates glass splinters from the heavier metals, which are then recovered. The industry is urging all electronics amateurs, experimenters, repair shops and the general public to cooperate in driving the rebrand racketeers out of business. Smash everyone of your used-up tubes. Don't sell them and don't give them away. The tube manufacturers themselves are aiding local law enforcement in bringing these forgers to trial. Some companies have assigned detectives to obtain legal evidence against the rebranders. A recently convicted rebrander was sentenced to two years in prison. He boasted that counterfeiting could have brought him an income of $25,000 annually if he hadn't been too lazy to work steadily! Sylvania Electric Co. has offered a $1000 reward for "information leading to the arrest and conviction" of individual or company fraudulently branding tubes with the Sylvania name. The Philco Corporation buys up all old tubes for five cents each. These and other measures are designed to pull the rug out from under the rebranding racket. Junk-Selling Methods. The tube counterfeiter usually is a pretty slick operator. He tells a good story. The pitch might be that he bought unused quality tubes at an auction, when a service shop went out of business, and is passing on the saving to you. He might claim that an equipment manufacturer discontinued certain tube types in his equipment and sold these unused quality tubes at a loss. To sidestep suspicion, the forger often mixes a number of good tubes into a pile of duds to be palmed off to gullible customers. Quality control programs supplement regular production testing to make sure that all tubes sold under brand name meet specifications. Scientific sampling techniques validate spot testing. One sure way to know if the tubes you buy are unused factory-tested quality products is to insist on a carton with the warranty information printed thereon. You are not likely to go wrong if each and every tube comes in a new brand-name carton. There are no legitimate tube "seconds." Tubes that fail to meet specifications are not marketed by responsible manufacturers. Instead, they are smashed at the plant in large machines to make sure that no defective tubes reach the market; for a dud is never a bargain.